The Old Fort monument is a 14.5-foot pink granite arrowhead atop a river rock and masonry base of slightly more than fifteen feet. The monument sits in a pool originally meant to be filled with water. The arrowhead is hand carved out of a stone slab from Salisbury and the river rocks are from Davidson’s Mill creek, which runs nearby. On the north side of the base is the steel or iron dedication tablet; the frame of which forms an ancient Greek or Roman building. The west-facing side of the arrow holds a metal tablet depicting the profile of a Native American with a headdress that was intended to represent “Chief Sequoia” (Sequoyah) of the Cherokee. This tablet is also framed in the form of a Greco-Roman building with the Sequoya bas-relief set in a secondary frame inside. Inside this frame, above the Sequoya image, is APPALACHIAN INDIAN ROAD. An old hand colored post card shows a set of tomahawks crossed over a musket and powder horn. This feature was shown on the side of the arrowhead which now holds the Sequoya tablet. It was not determined when the Sequoyah tablet was added to this arrowhead but it would have been prior to 1938. Numerous news article from the time do not mention the tomahawk/musket feature. A photograph taken a week before the dedication does not show it although it appears that holes had been drilled to accommodate something. What is almost certain is that the Sequoya tablet was a later addition. It would have been created by the Boone Trail Highway and Memorial Association, led by J. Hampton Rich, which placed hundreds of Daniel Boone, Buffalo Trail and Indian Road tablets across the United States. Although Rich spoke at this monument's dedication, he was not the keynote presenter and there is no evidence his organization had any hand in its creation. 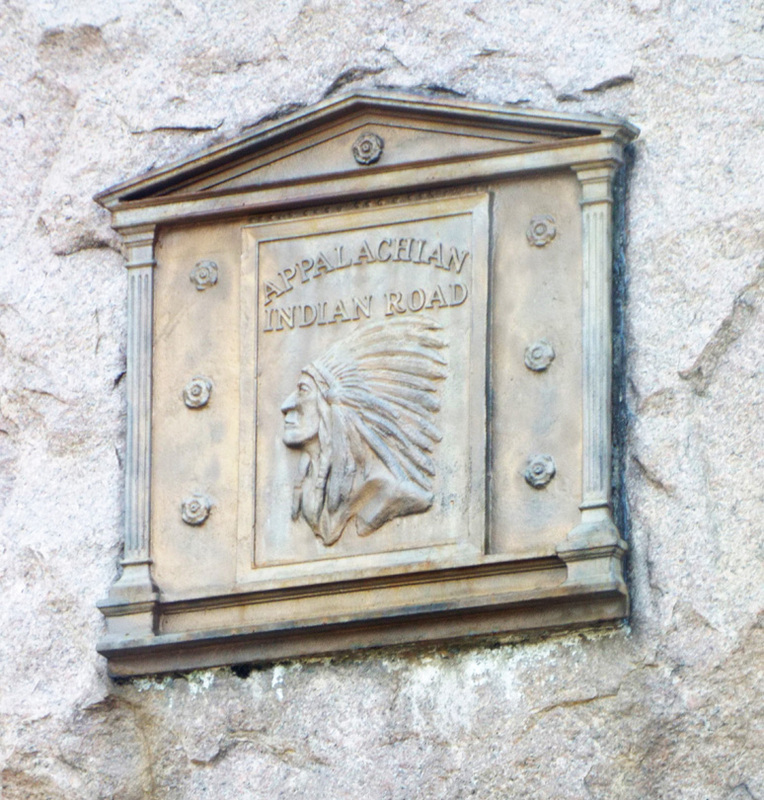 It seems likely that the first Appalachian Indian Road plaque was placed later at a different location and a news photo of that tablet does not show the Greco-Roman style frame. It was not determined when the Sequoyah tablet was added but J. Hampton Rich is not though to have placed any memorial tablets after 1938. Because of the tablet this monument is included with other Boone Trail Highway Memorial Association markers and was numbered 30 by Everett G. Marshall. His interest and research of the markers led to the book, Rich Man, Daniel Boone. 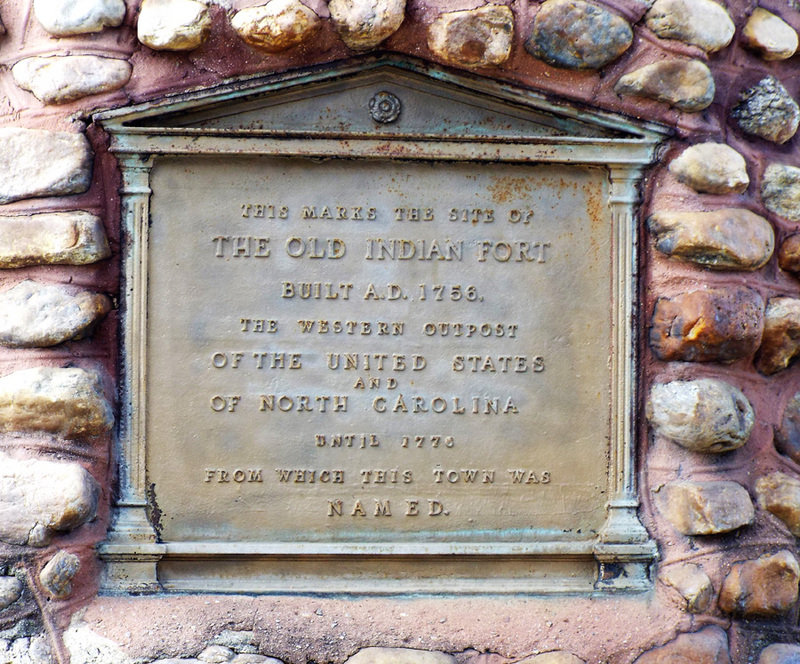 THIS MARKS THE SITE OF / THE OLD INDIAN FORT / BUILT A. D. 1756, / THE WESTERN OUTPOST / OF THE UNITED STATES / AND / NORTH CAROLINA UNTIL 1776 /FROM WHICH THIS TOWN WAS / NAMED. "Old Fort to Unveil Indian Arrowhead Marker Today," Asheville Times, (Asheville, NC), July 27, 1930. The dedication took place on July 27th, 1930. D. T. Roughton, president of the Old Fort Memorial Association, was Master of Ceremonies for the event which was attended by an estimated 6000 persons who gathered from all sections of Western North Carolina. The Rev. E. J. Ingle of Old Fort Baptist Church gave the invocation and a welcome was given by Dr. D. M. McIntosh, Old Fort Chairman of the Committee on Design and Location. The Rev. Clarence Stewart McClellan, Jr., rector of Calvary Episcopal Church at Fletcher, gave an address, "Pioneers". On the program he was also listed as "Radio Artist and Founder of the Open Air Westminster Abbey of the South". J. Hampton Rich of Winston-Salem, Chairman of the Boone Trail Memorial Association, gave an address, "Pioneers of the Appalachian Mountains". The Honorable Zebulon Weaver of Asheville gave an address: "Pioneers and Their Descendants". "The Red Man" was the subject of an address by the Honorable R. R. Reynolds of Asheville. The program also lists "Informal Talks by Distinguished Visitors". Twenty Indians, representing the Cherokee and Catawba tribes, were seated on the speakers’ platform. The two tribes, at one time bitter enemies, formally smoked the pipe of peace while 6,000 persons looked on. The Indian Tribes were represented by Chief Tahquittee and others from the Cherokees; Chief Sam T. Blue and the Catawbas, and Chief Carl Standing Deer, Instructor of Archery at Wild acres, near Little Switzerland. The marker was unveiled by Margaret Marie Nesbitt, nine year old daughter of Mr. and Mrs. J. N. Nesbitt of Old Fort, and direct descendant of one of the first settlers of the valley. The Rev. J. C. Umberger of Old Fort Methodist Church pronounced the Benediction. Music was furnished by the Bugle and Drum Corps of Gastonia; and the Marion and Old Fort Bands. Mrs. George Sandlin was General Chairman of the Program Committee. Originally dedicated to the pioneers who founded Old Fort, the monument has since come to represent peace between the settlers and the native Catawba and Cherokee Indians. It stands adjacent to the Old Fort train depot and within a few paces from the train tracks. 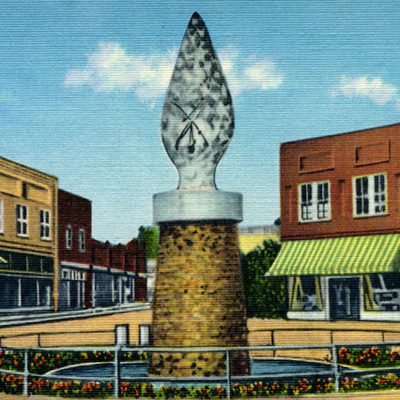 Along with its commemorative value, the sculpture might also serve as a beacon for tourism, a historically important industry in the area. 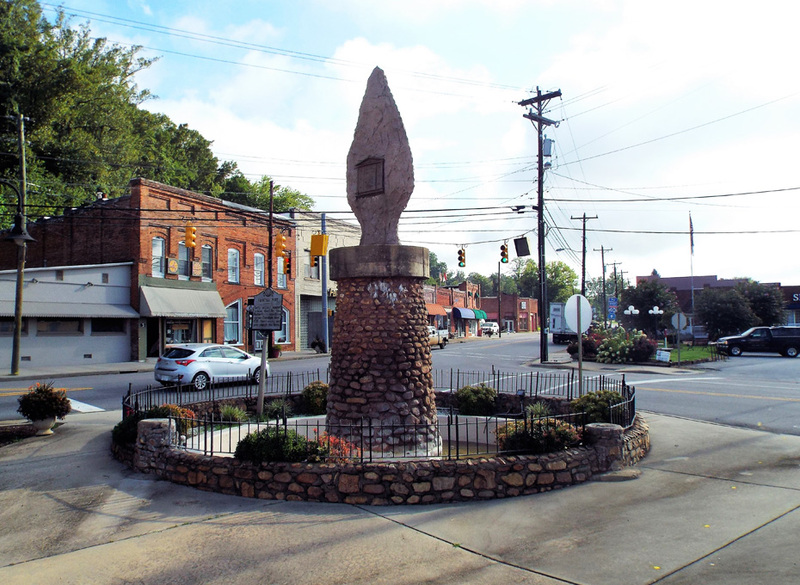 The monument is located at the intersection of Catawba Avenue, North Railroad Street and West Main Street (US Highway 70) next to the old train depot in Old Fort. The monument is positioned so that the broad-sides of the arrowhead face east and west, following the railroad tracks. A short distance away at the other end of the train depot is the James W. Wilson Memorial. The monument sits in a fenced off fountain adjacent to the depot. It is surrounded by sidewalk so that a viewer can examine it from all sides.